One of the great things about the STC is that, in hobby terms, there's not much difference between a Rhino, Predator, Razorback, Whirlwind or any of the other Rhino-based models. In fact, you should almost never buy a Rhino model because these other models all include the necessary parts to make a Rhino; plus whatever special add-ons come with the box you bought. My box is a Predator, and as you can see it is just as easy to become a Rhino with a few well-placed magnets. I do plan on painting the interior of the model, and the round magnet will have a painted door seam with my Chapter logo to help it blend in better. If you are like me and use big magnets and have chunky fingers, you might have trouble getting your Rhino doors detached. Just use the sponson from that side to help pull it off. The magnet on the back of the sponsor will be closer than the magnet attached to the Rhino's interior making it an easy job. Magnetizing the guns on the sponsons was a little more difficult. I wanted to avoid having to create any pieces and still wanted the tilt and pan of the weapon mount. So I decided to magnetize the interior of the gun halves. They go together surpisingly well, although I might need a small pair of magnets at the tip of the lascannon barrels. What vehicles have you magnetized? And is there an easier way to change out the Predator sponson guns? I'm also working on a magnetized Predator and will be sharing some thoughts on Turret magnetizing later this week! So stay tuned! Great article. I was thinking about doing this too. I have a Land Raider Redeemer that I also need to look into magnetizing. the way this person magnetizes the sponsoons may be a better way. I've only recently been able to source magnets in my area but I've gone magnet nuts. In the last 3 weeks I have magnetized my Baneblades sponsons, drop pod doors, dreadnaughts arms and torso ( bought all the forgeworld ones), a looted defiler (see my P&M thread) and a battlewagon so that it can be open topped, have an ard case and multiple turret options. Currently I am working backwards through my collection with a 2mm drill bit magnetising everything. Next I plan on doing my tau tanks engines, any suggestions on what size magnet would be best foe that? I have 2mm, 3mm and 6mm? I've been thinking about magnetizing two alternative fronts for a set of CSM rhino/vindicators, I'm using bits and converting the main hull so it's only really the front plate / cannon area that would need to swap, I think. Plus a removable siege shield / dozer blade (but again I'm not using the supplied version of that). i've got the 2 FW death guard dreds that have magnetised weapons. quite easy to do - just make sure you got the polarity right! 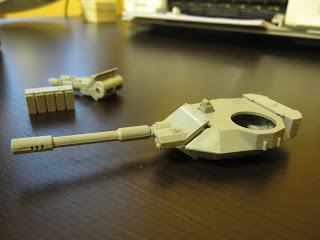 Well, in continuing with the magnetic theme from last Friday, I thought I would share some additional thoughts on a different section of the Predator tank, the turret! When I got the word that realgenius wanted to do a magnetic Predator quick tip last week, I was really excited, because just the week before, I had started gathering materials for just that myself! And this being my first foray into magnets in minis, I was really looking forward to his insight into the subject. I was most definitely not let down either! I decided I would start with the turret on mine. I know that I'm really not going to use the autocannon all that often considering the foes I'll most likely face ( most of them being marines ), but just having the option open to me, makes the Predator worth just that much more. To start off with, I installed magnets in the turret weapon mounts themselves. I did this with the turret still open, and let both sides dry completely before moving on to gluing the turret together ( with yet another layer of super glue at the top of the magnets ). From this view you can see both the placement of my weapon mount magnets and my vertical alignment magnet. 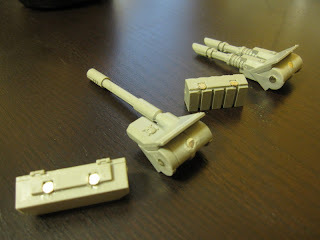 I used the magnet at the top of the turret in addition to a magnet installed into the back of the weapon. You can see the placement of both the balancing magnet, as well as the weapon mount magnets in the sides. For the weapon mount magnets I cut clean the normal studs and drilled out a hole to embed the magnets. In this photo you can also see the ammo box magnets, these were simply glued into the slots on the boxes. 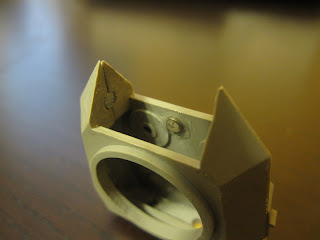 The back of the turret was drilled and magnets placed in the corresponding spots. All said and done, it was well worth the little bit of extra assembly and will really add value to every kit I purchase from now on. Magnets save you money, plain and simple. Laying siege to the Temple of Pecans. I got myself some magnets and want to start modularizing. Whats the best way to make holes to insert the magnets? Man ur gr8 i like this very much but if you use bigger magnet you can move it by not even touching it. Honesty, with all the bits available on the internet magnatizing weapon loadouts for the turret is a waste of time. Same with the sponsons. Make a turret for each weapon. Make a set of sponsons for each weapon. Magnatize the sponsons to stay attached to the Rhino hull. That's it. Too easy. The posters point is that you can magnetize the sponsons and turret so that you get the maximum amount of usable pieces out of a single box set. Yeah you can buy more bits from online, but that is hardly thrifty. Magnets, on the other hand, cost a couple bucks for a few hundred. That is very thrifty!